You are here: Home / Bathrooms / Is it difficult to replace a bathtub and tile surround? Is it difficult to replace a bathtub and tile surround? When homeowners decide to improve and update their bathrooms, they often think a remodel requires the purchase of all new fixtures and accessories, especially when their bathtub and tile are old, damaged, or an outdated color. However, it’s important to understand what’s involved with bathtub and tile replacement before choosing that route. 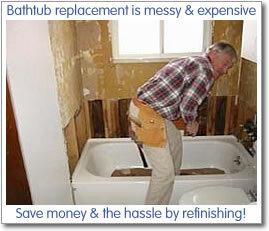 Bathtub replacement is a messy, somewhat lengthy, and expensive process that is a job for a professional. A tub must be removed from its current space, and if it’s placed in between two walls, you run the risk of damaging those walls and what’s behind them in the demolition process. You also have to consider any plumbing work that may need to take place during the process. The price of the new tub, along with the costs for demolition and removal, installation, plumbing work, and the likes can exceed $3000 – this is definitely an option that should only be considered as a last resort. Bathtub surface refinishing is a cost-effective alternative that can be completed in just a few days, restoring your tub and tile to a beautiful, like-new look and feel. Miracle Method comes to you and will refinish your tub without removing it. Our finishes are very durable and will give your tub and tile another 15 years or more of usable life. 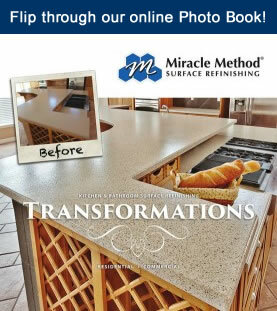 If you are thinking about replacing your bathtub and tile, we recommend that you visit the Miracle Method website to learn more about how refinishing compares to replacement. Use our online locator or call 855-212-7337 to reach the Miracle Method franchise closets to you.